The impact of contact center agent soft skills on call center CX cannot be overstated. Customer service is not a new concept. Every business knows that making sure your customers are happy is the best way to keep them coming back. It’s what the customer experience (CX) is all about. However, what companies are finally realizing is that positive customer experiences have far less to do with hard skill knowledge—education, background, abilities, etc. Instead, they have far more to do with soft skills. Soft skills—such as the ability to communicate, problem solve, and be flexible—are directly responsible for impacting your customer’s emotions, which are, in turn, responsible for customer satisfaction. Satisfied customers are more loyal, spend more money, and remain a customer for longer. This article will go in-depth into the importance of call center agent soft skills, how those soft skills relate to emotional intelligence, how you can hire and train for these skills, and how you can measure the impact of soft skills on your overall call center experience. First, we need to talk about what exactly agent soft skills are. Whether you’re looking to hire new call center agents or better train your current agents, you need to know what soft skills make your agents’ successful. Soft skills cover everything from empathy to active listening, good communication, leadership ability, and more. They are the character traits and interpersonal skills of your employees that allow them to effectively do their job. They define a person’s relationship with others, and have more to do with who a person is rather than what they know or have been taught. There’s a reason why Deloitte’s 2016 Global Human Capital Trends report reveals that 92% of executives rate soft skills a priority. Soft skills are critical to fostering employee retention, improving leadership, and building a meaningful culture. So, what call center soft skills are valuable to your company’s success? That depends on your call center agent duties—they need to line up. There are many characteristics that can lead to engaged employees and low call center turnover. Everything from great communication skills for call center agents to flexibility and problem solving are helpful. They all ensure that your call center agents can do their job, greatly improve the customer experience, and ensure your agents feel comfortable with their role. Specifically, here are the seven call center agent soft skills that are needed most. Communication Skills: Agents spend the majority of their time talking to people. This is the heart of their job. Communication skills for call center agents can make a huge difference between a successful call center that’s performing well and one that’s on the brink of failure. The Ability to Learn: A call center employee is constantly challenged to learn new scripts, products, and systems. The Ability to Meet Goals Set by Others: Call centers are numbers driven, so you need employees who can meet those goals. The Ability to Work in a Structured Environment: A typical call center has scripts, data, and desks that fall into a routine. The Ability to Find Answers: The script doesn’t always work, and there are times your call center agents need to help customers outside the known. Flexibility: Your agents need the ability to react appropriately in any situation. Problem Solving Skills: Call center agents who can think critically are invaluable. These agent soft skills are vital to a successful call center experience, but they don’t cover every aspect of your call center’s performance. In fact, one might argue that we’re missing the key ingredient in the call center customer experience: emotional intelligence (emotional IQ). Emotional Awareness: The ability to identify and name emotions. Harnessing Emotions: The ability to apply emotions to thinking and problem-solving situations. Managing Emotions: The ability to regulate emotions when necessary, your own and others. While a common term (especially in terms of academic research), emotional intelligence is not often used in the call center. More often than not, it’s referred to as empathy or encompassed in the idea of soft skills because it’s all about the call center employee’s ability to keep a customer satisfied and to handle their job. However, it should be considered separately. The relationship between emotional intelligence and customer service is well known. Customers respond best when they have strong emotional connections with call center agents. 86 percent of customers claim that a positive emotional connection with a call center agent would make them more likely to do business with that brand again. And, in a study of more than 900 customers, researchers found that dissatisfied customers are more likely to complain, switch brands, and talk about their unhappiness. You can’t get away from the fact that emotions impact the customer experience in many ways—positive and negative. The reality is that 95% of purchasing decisions are made subconsciously (due to emotions), which means your call center agents need a high degree of emotional intelligence. One bad customer experience can be the difference between a long-term customer and that same customer heading toward the nearest exit. That’s why it’s vital to deliver both functional and emotional outcomes if you want your customers to feel brand loyalty. However, this isn’t always straightforward. To bridge the gap between your call center agent’s emotional intelligence and customer service, it’s all about making emotional IQ essential. There are six key behaviors associated with high emotional intelligence in the call center. Each of these behaviors can help your agents provide a better quality customer experience and can arm them with what they need to exceed customer expectations. 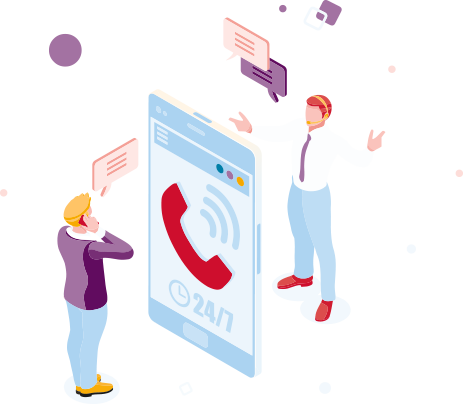 Anticipate customer requests: Customers feel connected to agents who can recognize their needs and shorten the time to resolution. Deliver explanations and justifications: Providing facts, explanations, and justification helps a customer understand what’s happening and feel better about the situation and challenges-at-hand. Educate customers: Customers appreciate leaving a customer service call with more knowledge than when they started. Provide emotional support: A little empathy can go a long way in developing a relationship with the customer. Offer personal information: Call center agents who include personal anecdotes where appropriate create an emotional connection. Be authentic and get off script: Call scripts work well, but they can hamper an agent’s ability to have a real conversation. “How are you?” This simple but powerful question provides verbal cues for the agent to improve the customer experience. Clarifying questions: These types of questions ensure that your agent actually understands the customer’s challenges. Elevating questions: At the end of a call, it’s important to take a step back and assess how the call went. There’s just one problem. While soft skills and emotional intelligence can be learned and perfected over time, they are often difficult to acquire and change. That’s why it’s vital to assess and hire for these skills from the get-go. Soft skills—including emotional intelligence—must be screened through a five-step system that evaluates how prepared they are for the job. This evaluation process can include a two- to three-minute question and answer portion, a skills test, a personality assessment, a face-to-face interview, and a standard background check. Take a look at what is on a candidate's resume. Interview for soft skills by asking pertinent questions. Rely on candidate references for examples of soft skills. It’s only through this type of detailed hiring process that you can ensure you are getting the right candidates for the job. However, this doesn’t mean this is an easy process. It can be difficult to measure and assess soft skills because they aren’t quantifiable. You can’t just look at a resume and say, “Yes, they are an excellent communicator who demonstrates empathy.” If only. Instead, you have to dig deep to determine if your candidates have the necessary qualities. The best place to start is to first decide what soft skill is being evaluated. Each soft skill has a different method of evaluation based on the desired outcome. For example, a good communicator should be able to handle herself in a hostile conversation. The results would be different for problem-solving and different again for leadership. For each soft skill, you need to identify and find the specific actions/outcomes that you can measure. The more specific you are about the soft skill and its result, the more likely you’ll be able to evaluate it effectively. Once you’ve drilled down deep enough, you’ll tend to find specific actions that can be measured. On a resume, you should look for soft skill information based on the applicant’s behavior. For example, applicants who use Chrome or Firefox browsers are more committed employees and perform better in call centers according to Cornerstone research because it takes initiative to download a web browser beyond the automatically installed Internet Explorer. When interviewing, you should ask open-ended questions where applicants can communicate their soft skills through stories. Through references, you should probe for soft skill status and avoid asking “yes” and “no” questions that don’t allow for nuanced information. Assessing and measuring soft skills in the call center hiring process is the first step to improving call center performance, but it’s not enough. It’s an ongoing process that will require development no matter how difficult. You need to take the time to train your call center agents in soft skills and emotional intelligence. According to a recent study from Boston College, Harvard University, and the University of Michigan, soft skills training can boost productivity and retention by 12% and deliver a 250% return on investment. But how do you go about training? As mentioned above, you have to first start with identifying a list of general soft skills that are important to your company’s goals (you can start with the seven soft skills we have already outlined or take a look at these 16 skills). Then, train from there. To ensure this training is effective, there are to main ways you go about training soft skills—self-study and live training. Self-study is targeted for an individual employee and focuses on their development needs. It’s often handled through books, audio, or online resources. Live training, on the other hand, provides instant feedback because trainers play a key role. It’s often focused on praise, correction, and development strategies. In the end, the best option for soft skills training for call center agents is blended training; where individual self-study resources are combined with live training. In this way your call center agents can focus on the self-study potion when time permits and then use the live-training to supplement what they’ve learned by asking questions, getting feedback, and practicing their skills. After all this assessment, hiring, and training, how do you make sure it worked and you have the right call center agents in place and performing the way you want? That’s where Emotive CX comes into play. Emotive CX looks at how the emotional intelligence of your call center agents directly impacts the customer experience. At the end of the day, customers want to feel good (who doesn’t?). And Emotive CX provides you with the ability to measure, track, and improve every call center interaction. The simplest way to measure and quantify Emotive CX is through self-evaluated scorecards. These scorecards can and should be used before and after every call center interaction to assess how the agent performed and to empower them to improve the call center customer experience. There are three main scorecard examples when it comes to measuring emotional intelligence and customer service. Example 1: Did the agent recognize the customer’s mood? Example 2: Did the agent recognize the customer’s negative mood? Example 3: Did the customer get what they wanted? Each of these examples breaks down how well the call center agent demonstrated their emotional intelligence to intuitively handle the customer interaction. Based on how the agent answers the various questions within the scorecard examples, you’ll be able to measure and quantify how emotions affected the customer experience positively or negatively. What happens when emotional intelligence results in a positive customer experience where the agent was able to recognize the customer’s mood and give the customer what they wanted by the end of the interaction? First, of all, it’s great. A positive Emotive CX scorecard means that the customer is more likely to remain loyal, spend more money, and stay a customer for longer. Unfortunately, not every customer interaction will turn out positively. The good news is negative experiences are great opportunities to improve Emotive CX. When a customer has a negative emotional response or your agent didn’t demonstrate emotional intelligence, it’s an ideal learning opportunity for your entire team. The key is to immediately open up a dialogue to interpret what went wrong and come up with a plan for success. What was the customer’s backstory and situation? Did we recognize the customer’s beginning emotional state? In what emotional state did the customer leave? What was done over the course of the conversation to get that result? Role-playing with your agent using various scenarios. Talking to the customer to get their feedback. Workshopping to provide skills, ideas, and techniques for better emotional intelligence. Ultimately, if you want to keep an eye on the emotional intelligence and soft skills of your call center agents, you should consider how CSAT and NPS scores are correlated. CSAT Scores: Customer Satisfaction (CSAT) scores are a widely accepted metric used to determine if support teams and companies have kept customers satisfied. It’s directly correlated to the quality of customer service with a score of 98% excellence considered the CSAT benchmark. Both of these scoring metrics ultimately help determine if a customer is satisfied and demonstrate how well you achieved everything we outlined above. There’s a lot that goes into recognizing and understanding the impact of agent soft skills and emotional intelligence on the call center experience. It’s not an easy concept and every customer interaction has a different result. But by learning the value of these qualities, how to measure them, and how to train and improve them, you can directly impact your company’s bottom line. Scorebuddy is a cloud-based contact center QA and staff quality monitoring Tool. This simple staff scoring solution replaces spreadsheets and documents for contact centers to score calls, emails or chat. Clients include Airbnb, Microsoft, TripAdvisor, The World Wildlife Fund, and hundreds of call centers and outsourcers around the world. Start your FREE 14-day trial to see how you can improve your call center QA immediately.